The Sewing Seeds of Faith Leadership and Development Center opened in November alongside the Refugee Service Center (RSC). Located in the same office building, this program is a branch of the Refugee Service Center that is dedicated to the professional advancement of refugee women. This new sewing program is a continuation of the Monday Sewing Seeds of Faith program and is focused on providing jobs and leadership training for the women who learned to sew through SSOF. After they finish this program, they can go out into their community, return to our SSOF program as teachers, or find jobs to help support their families and increase their self-esteem. 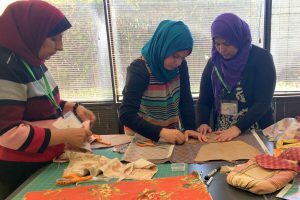 Note: The Monday Sewing Seeds of Faith (SSOF) program teaches sewing skills to new refugees using the generous fabric donations received from many partner churches. The teachers in this program are all volunteers. Fellowship, Devotions, and Pot-Luck lunches are all part of both programs.